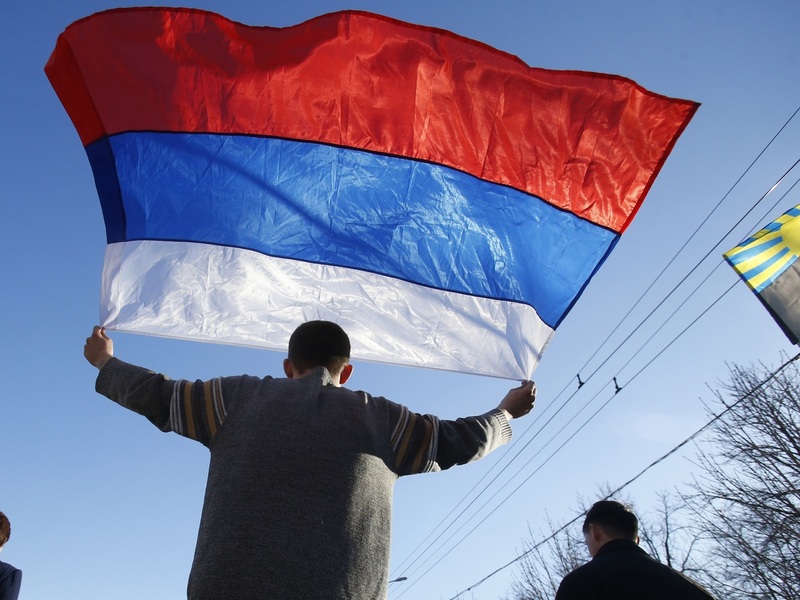 How Crimea's Annexation Plays To Russians' Soviet Nostalgia For those who viewed the end of the Soviet Union as a tragedy, Crimea was a chance to showcase Russia's strength. Now Russia may have changed its relationship with the outside world for years to come. An activist carries a Russian flag during a rally on Sunday in eastern Ukraine. According to political scientist Kimberly Marten, Russia's decision to annex Crimea from Ukraine may have changed its relationship with the outside world for many years to come. Marten writes, "The leader of a state that wields a massive strategic nuclear arsenal, controls a significant portion of the world's petroleum and other raw materials, and holds a veto in the U.N. Security Council, has just revealed his willingness to use force on behalf of ethnic nationalism. This was the nightmare that Western policymakers hoped to avoid when the Soviet Union collapsed." Marten is a professor of political science at Barnard College, the deputy director for development at Columbia University's Harriman Institute for Russian, Eurasian and East European Studies, and a faculty member at Columbia's Saltzman Institute of War and Peace Studies. She joins Fresh Air's Terry Gross to discuss Russian President Vladimir Putin's long-term goals and the history of Russian-Ukrainian relations. Putin is primarily focused on his domestic audience, not the international audience. He's made it very clear that he doesn't care what the world thinks of him, and he actually takes it as a badge of honor if people think that he's not a nice man. But, domestically, he is very concerned about keeping power, not even so much for the vast majority of the Russian population, because that's not who he cares about the most. He cares about the small group of elites that are in various circles of power in the Kremlin and immediately surrounding the Kremlin. And by his recent actions, he has shown that he no longer cares about the economic internationalists among the elites — the people who were pushing for Russia to join the World Trade Organization, the people who recognize that Russia's economy is in stagnation and that the only way to get it out of stagnation is to diversify beyond its petroleum dependence and to really become a player in the international economy. Putin has chosen, instead, to throw in his lot with ethnic nationalists, who are associated both with conservative elements in the Russian Orthodox Church and with the former KGB. Putin didn't get anything economically by taking over Crimea. Crimea has been very heavily subsidized by the Ukrainian government and is very dependent on the rest of Ukraine for its electricity supplies, for various other things that it requires, like water, to run its agricultural complex and its industries. It's not a wealthy country ... so he didn't actually get anything material by deciding to take over Crimea. What he got was the ability to come home to his home population and say, "Look how strong I am. They're not going to be able to insult us any more like they have been doing since the end of the Cold War. Russia's military might is back. ... I have now brought back Russia into the limelight, and I'm protecting the Russian population." There certainly were Russians who were in the Russian parts of Ukraine during the Russian empire who got along very well with the Ukrainians. Russians and Ukrainians, especially in the east part of Ukraine and the central part of Ukraine, had considered themselves brothers. There wasn't this ethnic hostility that we've been seeing more recently. That is a more a function of the more recent history. There's no question [Putin] is stirring it up, and the thing that I found very striking in his major address to both houses of the Russian parliament a few days ago — for the first time, he switched from talking about Rossisskii, the interests of the Russian state, to talking about Russkii, the interests of the Russian people. There are two ways that you can talk about being Russian in the Russian language: Rossisskii means Russian citizens and Russian statehood; Russkii means the Russian ethnic group. And Putin's language in the speech a few days ago really started emphasizing Russia as an ethnic concept rather than Russia as a state concept, and I found that very disturbing because it's an indication that Putin is really throwing in his lot with the members of the elite who consider themselves ethnic nationalists. People remember with nostalgia how easy life was, and they also remember how great the Soviet Union was; how it inspired respect and fear in the rest of the world, and they were a superpower. People remember with nostalgia how easy life was, and they also remember how great the Soviet Union was; how it inspired respect and fear in the rest of the world, and they were a superpower. The end of the Soviet Union is really seen by many Russians today as a tragedy. It was something where the U.S. had promised great things if Russia were to cooperate and, in fact, everything that Russia did it did on its own. Russia gave up its military presence throughout Eastern Europe, and what did NATO do? NATO expanded into that territory. ... Russia invited the U.N. into Afghanistan to oversee the withdrawal of Soviet troops in 1989. And what did the U.S. do? The U.S., in the Russian view, flagrantly didn't pay any attention to the U.N. Security Council when it chose to make its incursions into Iraq, and earlier when it made its incursions into Kosovo with airstrikes. So for all of these reasons, a very large fraction of the Russian population, maybe a majority of Russians, feel humiliated by what has happened. They feel betrayed by what the U.S. and the West has given to them, they feel excluded from the economic opportunities that the European Union might provide, and thinking that now's their chance to get something back and to show the world that really you can't do that to Russia.